We are delighted to publish our Strategic Plan for St Martins, which shares our ambitions, plans and targets to take us through the next three years up to 2021. 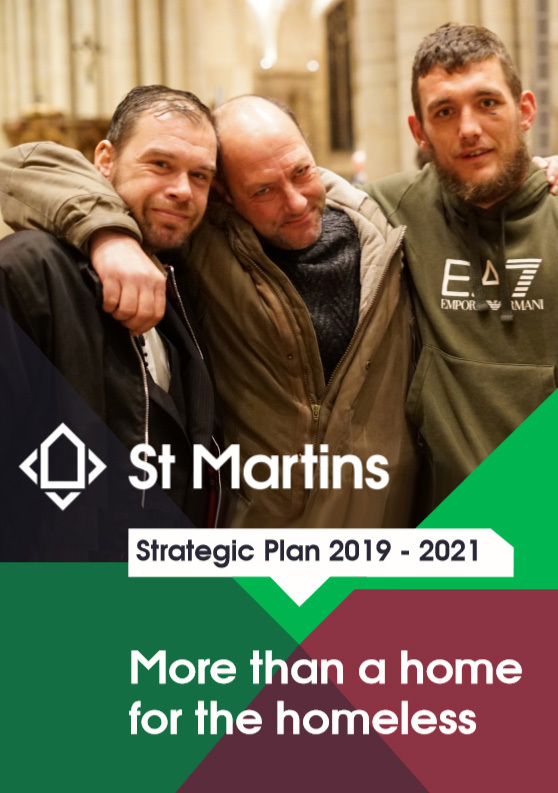 The strategy is entitled ‘More than a home for the homeless’, which captures the essence of St Martins; we recognise that people who are homeless or at risk from homelessness need a wide variety of support that goes beyond a bed for the night. We work hard to understand the needs of the individual and deliver the support that each person needs. The Strategic Plan will help us to focus our work and ensure that we continue to deliver high quality support to some of the most vulnerable people in our society. Whilst a lot of the plan focuses upon continuing to do what we do well, there are also some exciting ventures, including the development of a new housing service and the expansion of our fundraising activities. We started working on the strategy in summer 2018. Our Trustees held a strategy day where they received an update about the national issues from our CEO Dr Jan Sheldon and then heard presentations from the managers of our various services. We then used team meetings to gather the thoughts and feedback of staff. We also consulted with some of the people who use our services and invited stakeholders to consider our plans at the first meeting of our Advisory Group in September. As we’ve moved through each stage of the process we’ve made amendments and additions.